This recipe might best be called the “Calm before the Storm.” Thanksgiving is looming with its promise of feasts, indulgences and lots of leftovers. In anticipation of the predictable holiday chaos and our subsequent food coma, I aim for a moment of zen and economy, creating simple and efficient meals, deliciously comforting while using lurkers in the refrigerator as inspiration and freeing up space for turkey-centric leftovers. In this case, I unearthed a head of cauliflower from the vegetable bin, patiently waiting (as crucifers are so inclined) to be put to use from last week’s farmers market splurge. A chunk of pancetta gamely joined in, skirting its banishment to the freezer, along with a bag of well frozen peas eager for a defrost. Suddenly, I had an easy and healthy dinner on hand with no whiff of leftovers, stuffing or cranberry sauce – that will come later. Heat oven to 375 F. Toss cauliflower with 1 tablespoon olive oil in a bowl. Sprinkle with salt. Arrange in one layer on a rimmed baking sheet. Bake on lowest rack in oven until tender and bottoms are golden brown, 20-25 minutes. Transfer to top rack and broil 2-3 minutes until tops are tinged brown. Remove from oven. While the cauliflower is roasting, arrange prosciutto in one layer on another baking sheet. Bake in same oven on middle rack until dry, about 15 minutes. Remove from oven. When cool enough to handle, break into shards. Bring a large pot of salted water to a rolling boil. Add pasta and cook until al dente. Drain. Transfer to a large bowl. Add 1 tablespoon olive oil, peas and 1 teaspoon salt; toss to warm the peas. Add cauliflower, prosciutto and 1/2 cup Parmigiano cheese, gently tossing to combine. Taste for seasoning. Serve immediately with freshly ground black pepper and additional cheese on the side. Looking for that zen moment in my kitchen as well…This looks lovely. Your photos and recipes are always so fresh and fun. A delicious pasta dish! Really mouthwatering and flavorful. I spent much of the day today wondering how o thin out the bounty in my fridge. I too have a surplus of cauliflower- thinking of pickling some. I love your tip to roast the florets before adding them in and the orecchiette must hold the peas beautifully. This may just be our Monday night dinner. This looks just perfect! My kind of pasta dish. I love roasted cauliflower. Great use of what you had in your fridge – I love how meals like this are often the best! 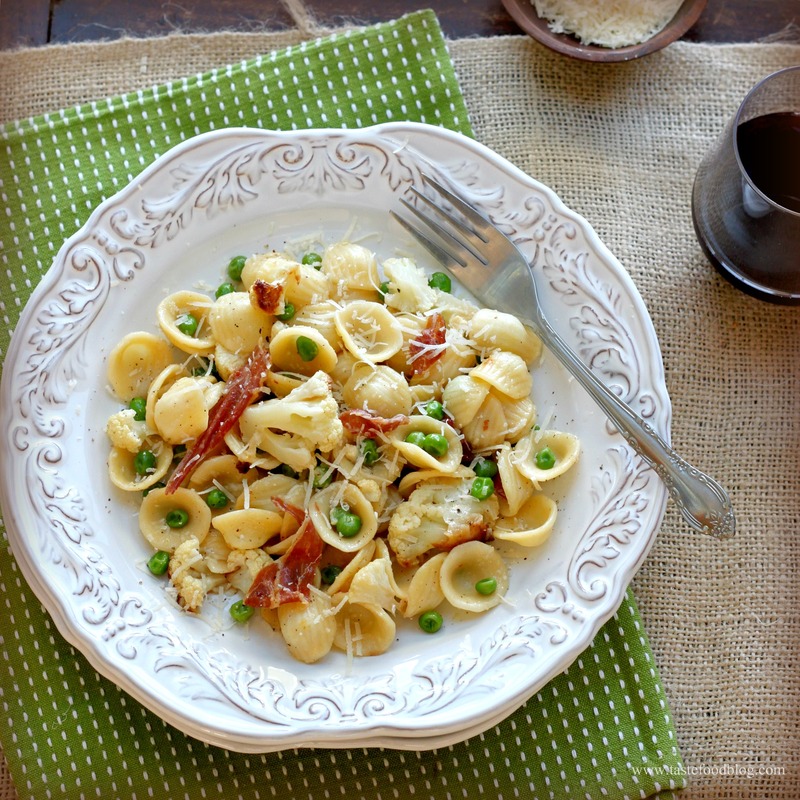 I’m def trying this one… I had read another blog a while back with orcchiette and now yours. I think these pasta shells are so cute! And perfect with roasted cauliflower! I would love a bowl of that! I love the feeling of cleaning up the kitchen by making good food. My twin and I try to do this quite often and love what can be created. Great simple recipe that I can’t wait to try. Happy Thanksgiving! That is exactly where I’m at: the simplest of cozy foods. We hosted an early Thanksgiving, and this is the first year that I’m not cooking the day of. It’s kind of a relief! I’ve had this recipe bookmarked for a quiet Sunday meal for a while. I just made it for dinner and it was great! The saltiness of the pancetta with the sweetness of the peas is just wonderful.